Lucic might be back in the lineup. Game-time-decision, etc. 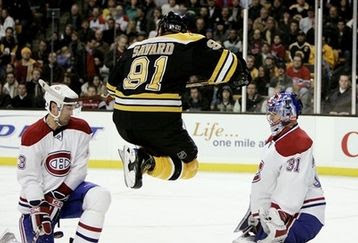 If not, we're looking at Kobasew-Savard-St. Pierre. Hnidy has been cleared for play, and will probably play with a visor. Lashoff got sent down. This is the 6th of 6 home games in a row, part of 10 games at home in January. Kessel is out with mono. Should've been less careful in high school and college, there, Phil. They think it's likely he'll be out a month, which is about 13 games, according to fluto and friends. The Bruins are missing 6 of their top players right now: Manny, Patrice, Sturm, Ference, and Kessel. At least the Habs are pretty beat up, too. The Bruins should make sure Komisarek continues to have bad memories of the Garden. Halak and Thomas in net today, Rask and Denis as backups. Fear not, Versus is bringing the NESN announcers on to call tonight's game. I guess Montreal doesn't have any announcers on VS.
Game 21: Bruins 2 Habs 2 SO WIN: Patrick Roy night in Montreal, and Thomas puts on quite the show. Game 16: Bruins 6 Habs 1 WIN: The only game in Boston so far this season. Lucic beat up Komisarek. The bruins mopped the floor with the Habs. Chants of Caaaarrreeeeeey echoed through the garden. What a game. Game 3: Bruins 3 Habs 3 SO Loss: All of Montreal's scoring is in 3:19 near the end of the first period in their home opener. The playoffs last year, and so many years prior. I want Lucic and Hnidy (and O'reilly and...) back in the lineup out of spite. FourHabsFans: "Pay your cover charge to - Cornelius Hardenbergh and The Hockey Blogging Adventure likes yelling and beer. We're like twins!" Stanley Cup of Chowder: A pretty good overall rundown. Double A Hockey: A good rundown of all the injuries on both sides. Check it out. Kynch's Korner: "Will the Habs go the whole circus route again?" The Bear Cave: "Fernandez is just the tip of the iceberg when it comes to Boston injuries at the moment"
NESN First Shift: Thomas vs. Halak - this is likely true, as Manny and Price are both hurt. My dislike for the habs has been tempered by reading Jack Falla. That said, I'd appreciate if they took a nice long slumber like some other original six teams have.